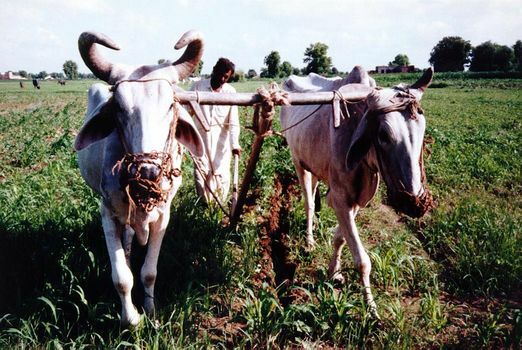 Although it's possible to show tractors roaring through the fields of the Punjab, the commoner sight in India is the age-old one of a man behind draft animals. 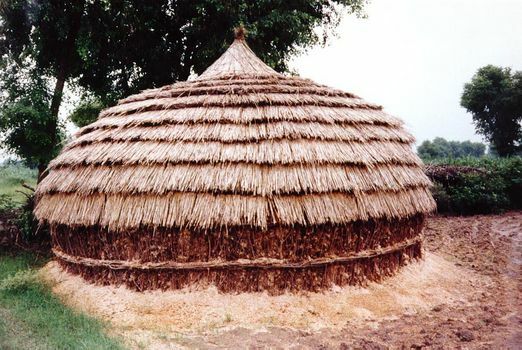 All those animals require fodder; hence the attention to neatly thatched fodder stacks. 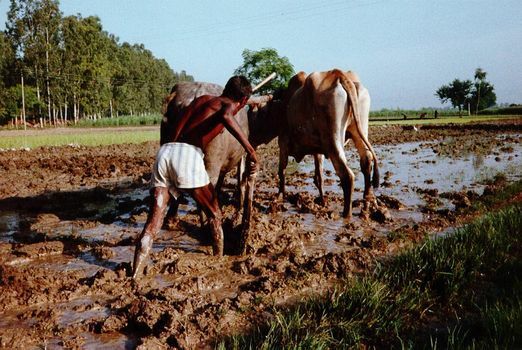 Puddling a field near Karnal, Haryana, so it will hold water during the paddy season. 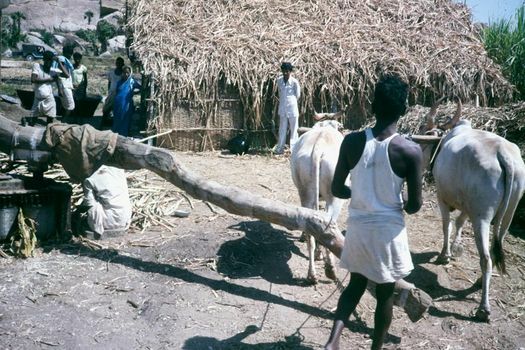 Across the road, a tractor might do the same work. The transition from hand labor to machinery isn't always welcomed, especially by the laborers whom the machinery displaces. 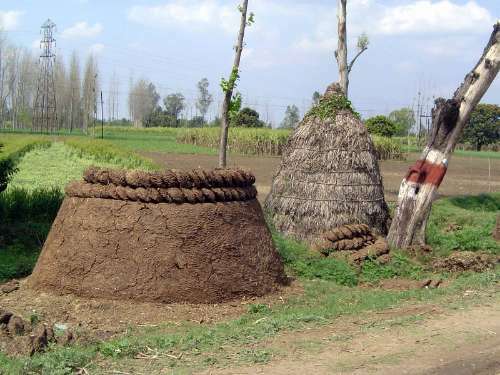 Cultivation south of Hissar, Haryana. 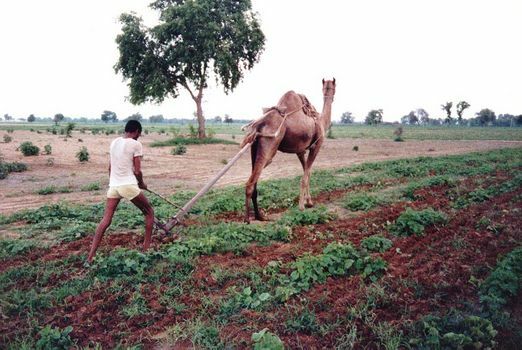 Nearby, a neighbor cultivates with a camel. To the south it's no great distance to the Great Indian Desert, or Thar. 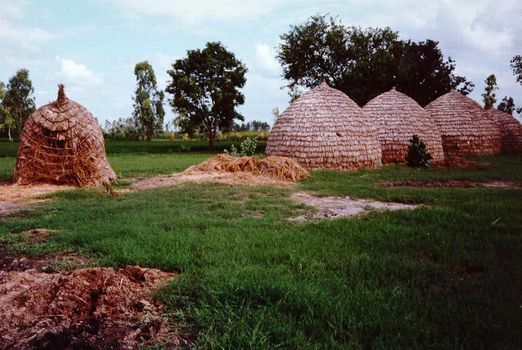 Straw is protected during the rainy season by ingenious, water-shedding stacks. As fodder is needed, the stacks are broken open. 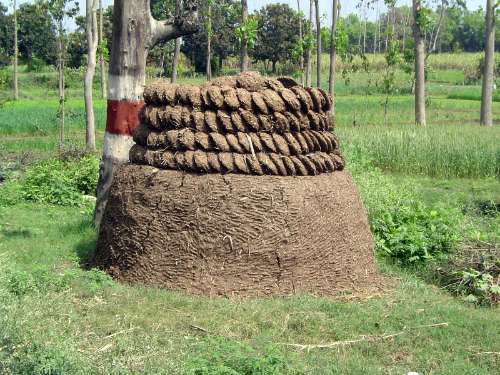 Here's an earlier stage in construction: cowdung cakes neatly stacked and ready for a protective wrap. It's an industry in itself. The first step is forming and drying the cakes. 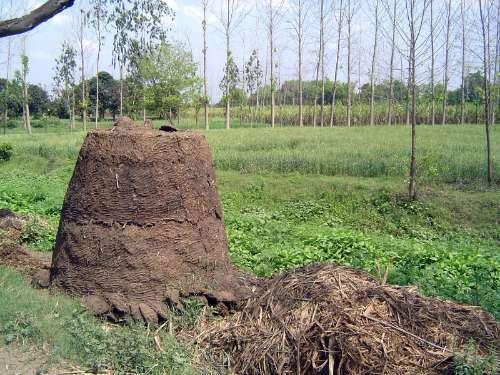 They burn slowly and so are a very desirable domestic fuel, even though experts interested in agricultural development have castigated their use for well over a century. Indian or British? 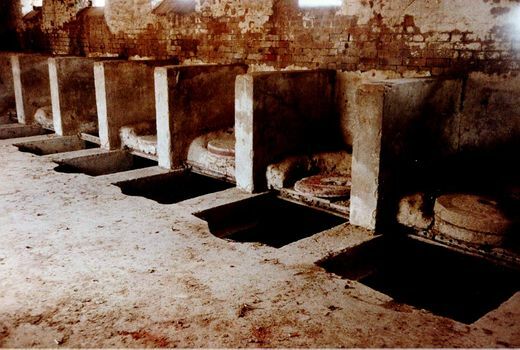 These grain mills, at a drop along the East Jumna Canal, are found in virtually the same design throughout northern India and Pakistan. 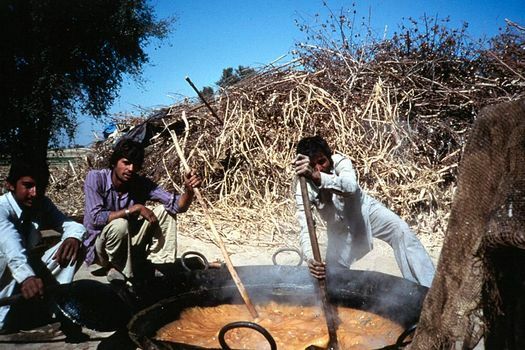 For pictures of the same kind of device there, see Pakistan: Swat. 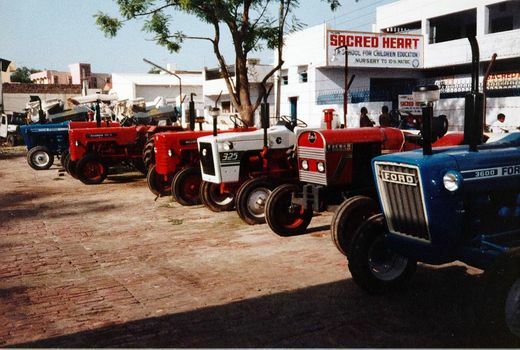 The winds of change: tractors for sale in Hissar, a town in an irrigated district west of Delhi. 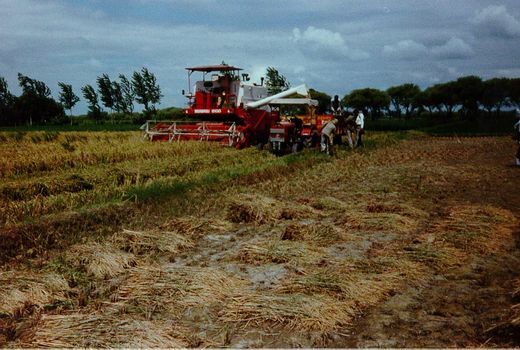 Rice harvesting by combine, west of Karnal. 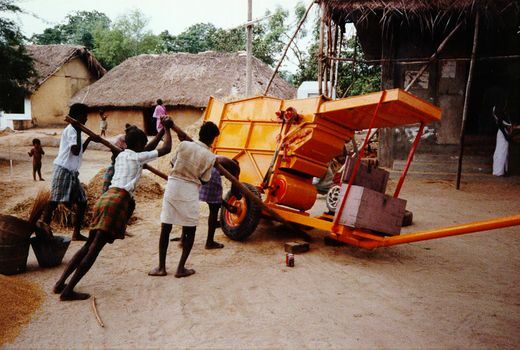 The brand-name is Swaraj, "self-rule," but though that name alludes to Gandhi, the machine itself echoes American harvesters. 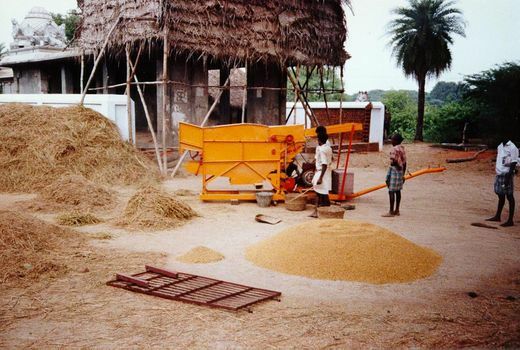 A portable thresher works the paddy harvest at Villupuram, west of Pondicherry, Tamil Nadu. Getting ready to move on to the next village. A more specialized crop: sugarcane growing against the rough countryside near the ruins of Vijayanagar. 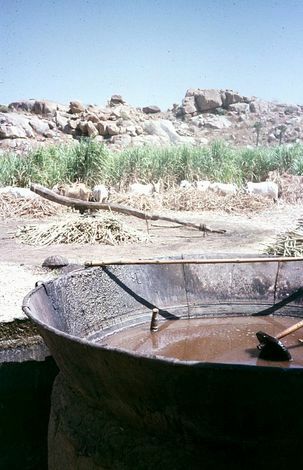 In the foreground, a boiler pan for the juice expressed by the bullock-driven crusher behind it. The British introduced steel-roller crushing machines. Between the drums at the left, a bit of crushed cane emerges. 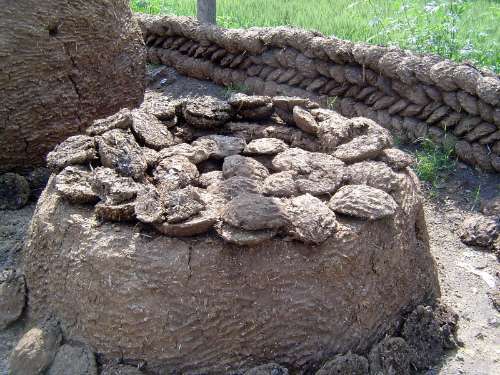 The juice will be poured into large pancakes to dry, then pressed into blocks. 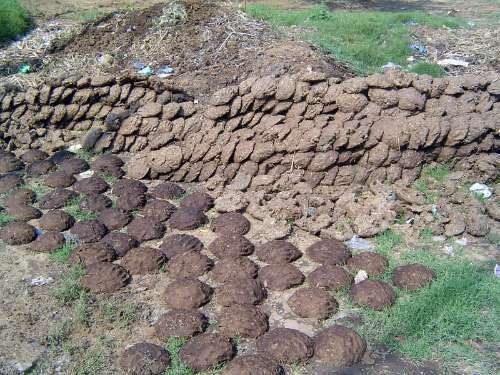 There are plenty of flies in the neighborhood, but the product--locally called gur but more widely known in India as jaggery--is very tasty, at least for anyone with a sweet tooth.